it’s not any warmer today than the previous few days (it’s cold, in fact—i think—for almost-april). and yesterday when we were out in the yard mincing around in our socks (well, david was mincing and i was perched precariously on the edge of the steps yelling “yeah baby, gimme sugar” to his feet. is it any wonder our neighbors look at us warily? ), the flowers were still buttoned-up tight and showing no signs of opening any day soon. i know i’ve been fussing like a big baby all week about when are the flowers gonna open, but i just wanted to see one. and for no apparent reason (it really is cold), today we have a veritable field of them out front. i hardly have any new knitting to show you—i’ve been joined at the hip to my secret project, which i am going to finish today (if it kills me, dammit). no, really, i am within finishing distance if i knit for the whole rest of the day without stopping. i don’t think i can get it blocked til tomorrow, but that’s ok—if i do, i will have achieved my (fairly random and arbitrary) goal of finishing it by the first of the month. hell, i’ll be shipping it by the first of the month if i get it done today. what can i say—i love being early for deadlines. so anyway, i didn’t start any new scarves yet, though i did write two of the patterns and sent them to the test knitters yesterday (which is why i didn’t finish my secret project yet). but tomorrow, i am SO there, knitting a little turquoise nothing during class. now my friend nan (blogless), who you might remember did a test knit of the snowflakes in cedarwoods shawl, has been sending me joyful emails all week complete with photos (she lives in a sunny, warm place; i’m so jealous). she’s so happy about finishing it that she can’t stop staring at it (you know the feeling!). and i’m so happy because she’s so happy (i’m sure you know that feeling too). and since she doesn’t have a blog, but she tests so many complex patterns, i just wanted to showcase her fabulosity for a bit. i think part of her joy comes from using quite a bit of the spare 5,000 yards of merino laceweight that was sitting in her stash. 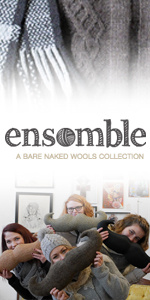 she said she was just wondering what she could ever do with it when i contacted her about the test knit. hehe. no problem nan—i got your back. so last night, after writing patterns and knitting on the Big Thing for many hours, i went up to watch TV with david (a really dumb movie posing as a french “film”—i hate those) and worked on my new sock. as i photographed it this morning, i could not see one reason why i should keep going with it; i do like the yarn, and i might like the stitch pattern in something different (sigh, and i had such high hopes for it here), but i hate the way it looks with the ribbing, and a 2 x 2 rib wouldn’t work either (ask me how i know). hoo-boy, did THAT feel good. I guess it didn’t feel so cold to the crocuses. Love the shawl! That is one gorgeous knit. And she is clearly a talented knitter. Nan, brava woman! Well and beautifully knit! Wow…your flowers are gorgeous! I really love the white ones. Yay for the crocuses! (croci?) Mine have come-and-gone since we had an early warm-spell but last night we got TWO INCHES of snow!! My grape hyacinths are out there saying “what the HEY? !” As a bonus though, the frolicking bunnies in the yard are super-fun to watch. I second-or-third the kudos to Nan! The shawl is awesome! Anne, make sure they take you to Balboa Park when you are there, it’s my favorite place in SD, there’s a space off to the side that is all artist’s studios and on weekends they open them to the public to sell their wares 🙂 Oh and the lathe conservatory! And… and…!! I’m so jealous 🙂 Have a great time! With those photos, you could publish a calendar! I LOVE spring flowers…they are just so beautiful and welcome! Nan’s shawl looks great too! I’m glad I’m not the only one who unpicks things. Or frogs them. Whatever. I still remember the first time I consciously planted bulbs (a birthday gift – perfect for a September baby) and had to trust that they would produce something of beauty. With anticipation/trepidation, I waited the long dark winter for the lovelies to come up, grow and bloom. Lo these many years later, I still have a quickening of my heart as the bulbs give way to their very nature… to grow and live and delight each of us. They give us hope and reveal that there is another place to “open into” for each of us. Thanks for the pictures of your flowers! It gives me hope that Spring will come one day… I guess it won’t be that long before it gets here, but there’s still quite a bit of snow on the ground, way too much to think that flowers will come out anytime soon. And yet once again, you crack me up with the unraveled sock photo…. heh heh. Wow have you been productive today. I’m still trying to organize all my photographs so that I can pick ones to send to the lady putting together our website. I cannot believe how many different ways I named folders for pictures. And there’s so much I haven’t scanned! I hope I’m halfway as productive as you — at least for today. 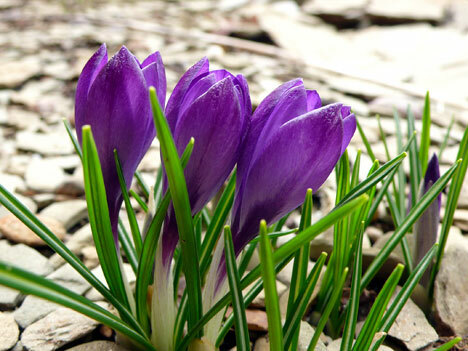 hmm…your crocus didn’t bloom until today? ours were open earlier in the week – i even took pictures, but they’re still resident on my camera…it’s always good to see them though – there’s hope that winter will actually end! You do make me laugh! I bet it felt good to rip that down if it was not making you happy! flowers? you have flowers? Our little crocuses are still under 3 feet of snow. I think we will probably skip crocus season this year. San Diego should be such fun. I love the yarn, but too bad the sock didn’t work out. That pattern just wasn’t right for it. And Nan’s work is amazing. 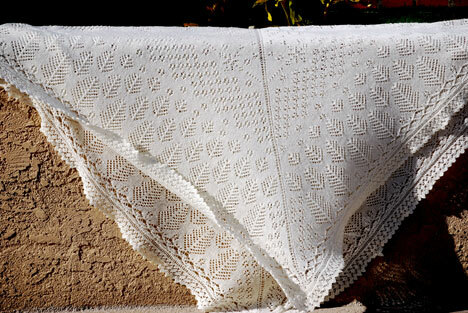 I bet that square shawl used up quite a bit of 5,000 yards of laceweight. Not all of it surely, but still a goodly amount. Our snow is gone, but I haven’t noticed any flowers. Of course, I didn’t plant any of my own…. And I’ve never envisioned David as the mincing type — granted, I’ve never met either of you — but the idea did make me laugh! 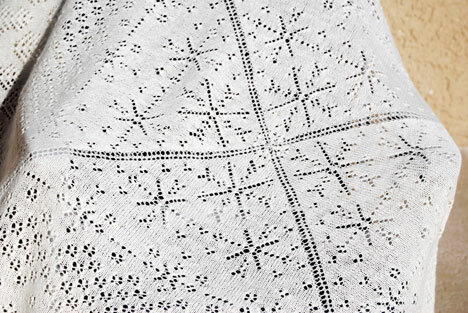 The snowflake shawl is just beautiful. I love your description of your photo shoot. I love your photos of your flowers too. Our yard is naught but weeds after too many years of too many illnesses for there to be time to keep the yard up. I was hoping this would be the year that would change but so far, not so much. Yes…..30 days, as a matter of fact, till you are in the CRAZY ZONE AT MY HOUSE!!!!!!!!!!! I am so excited!!!!! No worries – we have a crapload of flowers for ya…. and orange trees, and lemon trees, and grapefruits…..okay. I’ll shut up now. But we are excited to see you; leave your snow in OH though…. hahaha! 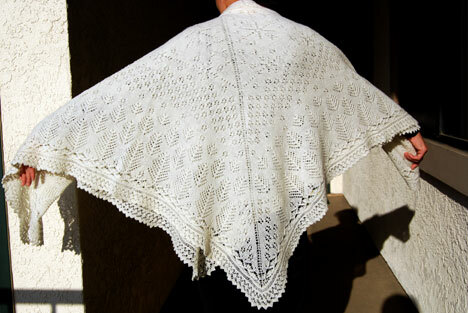 And Nan’s shawl looks totally awesomable. It’s so wonderful to see those little flowers ! There are some blossoms showing up on our fruit trees, if the weather will cooperate a bit (it’s still cold !) they will be in full bloom very soon ! love the photos of the flowers. Gives me hope for spring (I’m writing from Toronto where as yet the only sign of spring is a rather cold downpour today). Anne- I think I may see a crocus this year-but we have a large bunny problem. It’s still cold in Toronto, but with some rain, we may see flowers. Gives you hope, doesn’t it? I have to laugh at the flowers blooming, because we won’t see anything like that, here in Maine, for another month, if not longer!! The flowers are pretty, and I really needed a dose of them this morning. 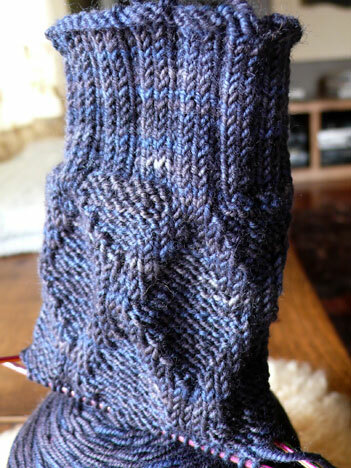 The shaw is still gorgeous–no matter who knits it! I really love the color of that dismantled sock. I can’t wait to see all of the new stuff! Happy Spring to you! We had mixed sun and snow last week, but yesterday was gorgeous! I was out planting my summer bulbs and doing up seed trays of tomatoes and flowers. Apparently this should carry on for the rest of the week, so my knitting may just have to wait 🙂 I’ve been in ‘frogland’ myself lately, so got a chuckle out of your sock. Once again you have sent me down memory lane….Thanks ! In my native Germany we had 100’s of early spring bulbs in the family garden…….here in Mexico it is unfortunately not cold enough. Well, it does get down to freezing in Mexico City….but only a few nights a year. Right now those flowers of yours look refreshingly cool….especially after weeks in the Yukatan jungle and temps in the mid to high 80’s here in Mexico City…..yes,I am back home ! 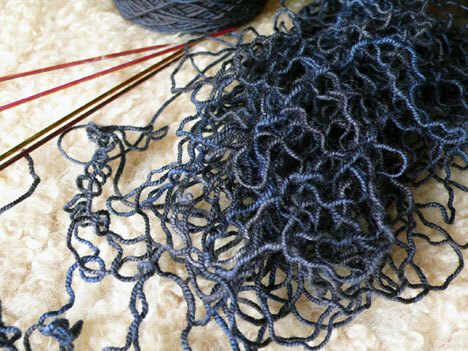 A questions about the shawl; was it meant to be this dense ( maybe not the right word…lol )or tight ? Would it get much lacier with bigger needles ? Even though I don’t like knitting with anything bigger then 3.75 mm. Just looking at it, I get warm…..of course that might be exactly what the rest of the world needs…lol…it is gorgeous and I would hate to not be able to knit it. That shawl is soooo gorgeous. I’m just wondering if I have the patience for a big laceweight project like that, with all those really long rows, but I think I’m close to talking myself into it. 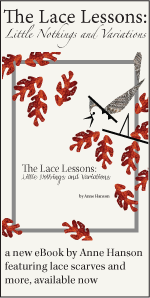 Anne, you are such a talented designer! I’m loving the Tesserae sock now on the needles. i’m soooooooo jealous of your flowers. 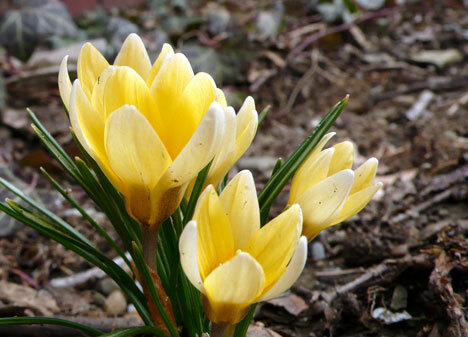 i really need to plant some this year – crocus are my favorites cuz they come up so quickly with no regard for temperature. Thanks for the pic’s of the flowers, it reminds me that it really is spring (even if it feels like winter still). Hope you’ve had success finishing up your Big Secret Project. My first thought on seeing the sock is that it was inside out. How about reversing the pattern, it does look like cool potential. Sigh. Crocus are one of my all time favorite flowers. And, unless I want to dig them up and put them in the freezer every year (yeah, right) they won’t grow and bloom here. Not nearly cold enough. Ha. Not cold at all. No crocus weather in these parts. Drat and double drat. Yours are gorgeous. Look at all those pretty colors. I did that very thing with a sock over the weekend. It can be rather liberating, can’t it? Ah flowers… That’s far off where I live (Montreal), I’d settle for melting snow at this point!